Most of us have also received “drive-by endorsements” — recognition for secondary or tertiary skills that are not at the forefront of our personal brands. These endorsements often happen because LinkedIn has planted the seed: Your connection saw your picture, matched with one of your skills, and was asked to endorse you for it. He didn’t think about it. He didn’t ponder whether you do other things better. He just clicked, and moved on. And LinkedIn swapped your photo for someone else’s. That’s not to say the one-click endorsement is necessarily bad. If the skill happens to be one of the ones you’re focused on, you’re fine. But oftentimes the endorsement is for a less-vital skill. And if you’re trying to build a personal brand around your digital marketing chops, it may not help that some people think you’re good at ping pong (even if you are). The better bet is to create a list of 10-15 skills that will truly help to advance your career, and get your connections to focus on them. This means you’ll have to pay attention to the details. Do some research in LinkedIn’s Skills & Expertise tool to find popular and improving keywords. Pay attention to spelling and capitalization (“Content Development” is treated as a separate skill than “content development” right now). And resist the urge to add a skill just because someone endorses you for it. Like anything with LinkedIn, be strategic about how endorsements can help you or your business. A colleague has been endorsed more for SaaS (Software as a Service) than for any other skill listed, but it’s not how she positions herself, and it’s not what she’s trying to do. Remember that you’re in the driver’s seat on your endorsements. Click the pencil icon next to Skills & Expertise area on your edit profile page to fine-tune what appears there. You can decide to remove individual skills already listed, or even select the endorsers you want people to see. 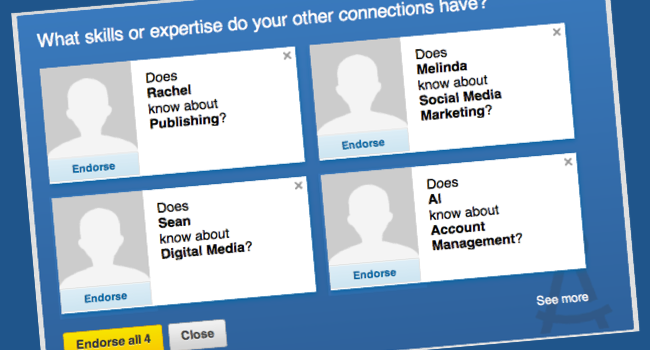 LinkedIn says more than 550 million endorsements have been made since the feature launched in the fall. That’s an impressive number, and a sign that we have to take them seriously. It’s not a hard to see a future where endorsements play a significant role in search. All else being equal, will a profile with 150 endorsements for Social CRM rank higher for that search term than one with 20? It seems likely. Will a recruiter or hiring manager look more favorably on a candidate with 100 endorsements than someone with 10? Probably. Pick your most important skills. Choose the 10-15 skills that help you the most, the ones that are most in demand or that set you apart. LinkedIn allows you to have 50 skills. Resist this. Having too many skills will likely spread your support too thin. Ask for endorsements. People don’t like to ask for help, but it’s worthwhile, and easy to do. Once you have your skills identified, send LinkedIn messages to the 20 or 30 people most likely to endorse you. Point them to your profile page, and ask them to select from the list you’ve given. Don’t accept everything. LinkedIn makes it easy for people to endorse you for skills you don’t already display. Those skills won’t appear on your profile until you accept them — and there’s no reason to do that if they don’t support your overall brand. Be on the lookout, however, for important skills you may have missed. And finally, don’t forget the importance of recommendations. Endorsements feel a bit like mini-recommendations, but they’re really little more than Facebook Like buttons dressed up for LinkedIn. A well-crafted recommendation — focused on your success and the skills that matter — can mean a whole lot more.